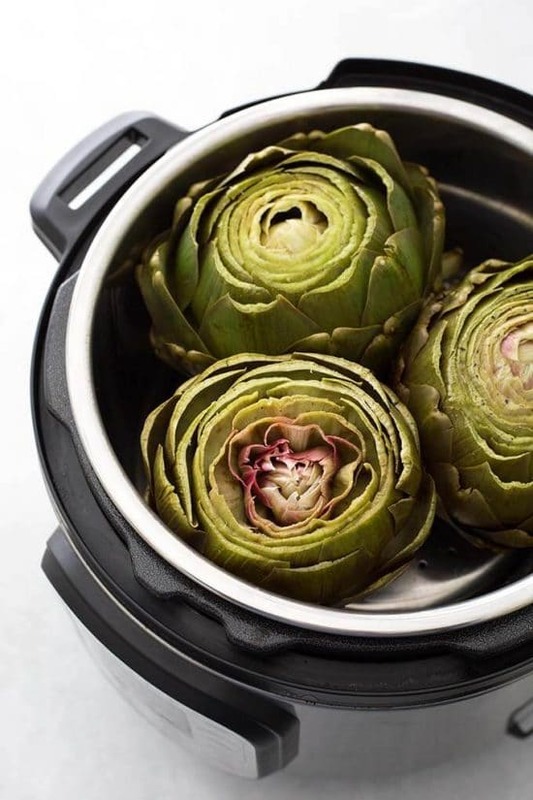 We’re updating this post to help you learn all about How to Cook Artichokes the Slow Cooker or Instant Pot, and I think artichokes would be a fun side dish for a romantic meal! Click to see all the Slow Cooker or Pressure Cooker Side Dishes! Click here to see The BEST Instant Pot Rice or Risotto Recipes! Artichokes are one of the foods I get excited about when they start showing up in the stores, and I love the idea of cooking them in the slow cooker or Instant Pot! And I think artichokes sound perfect for a Valentine’s Day dinner and this post gives you plenty of options for How to Cook Artichokes in the Slow Cooker or Instant Pot! What do you think? 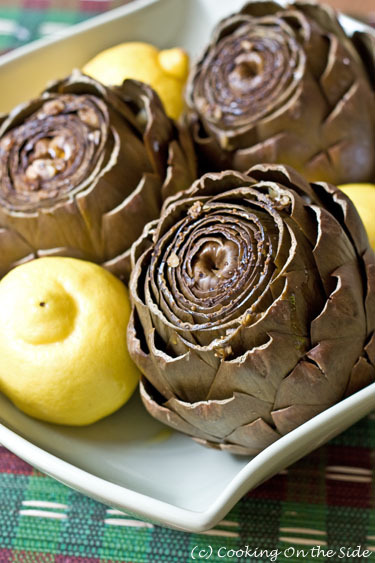 Would artichokes be a hit at your house for a special dinner? Use instructions for How to Cook Artichokes in the Pressure Cooker from Kalyn’s Kitchen if you want artichokes that cook in a few minutes. I originally used a stovetop pressure cooker to cook the artichokes you see here, but the recipe now has Instant Pot or Electric Pressure Cooker instructions as well. 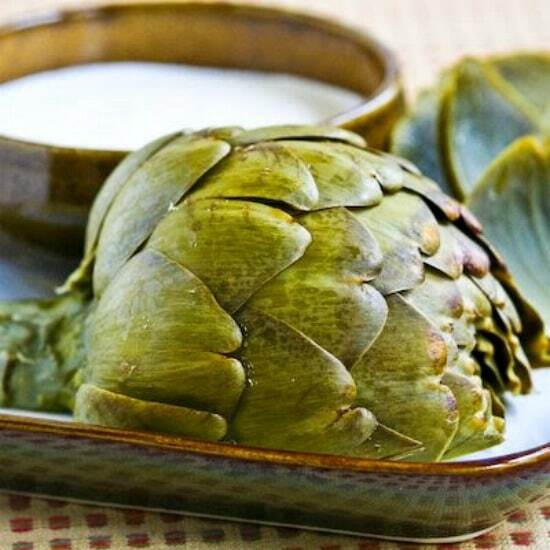 For Slow Cooker Garlic Artichokes from Cooking on the Side, you use fresh minced garlic, balsamic vinegar, and white wine or chicken stock in the slow cooker and make a beautiful side dish for dinner! Instant Pot Whole Steamed Artichokes from Simply Happy Foodie has more tips for Instant Pot artichokes if you pick that method! 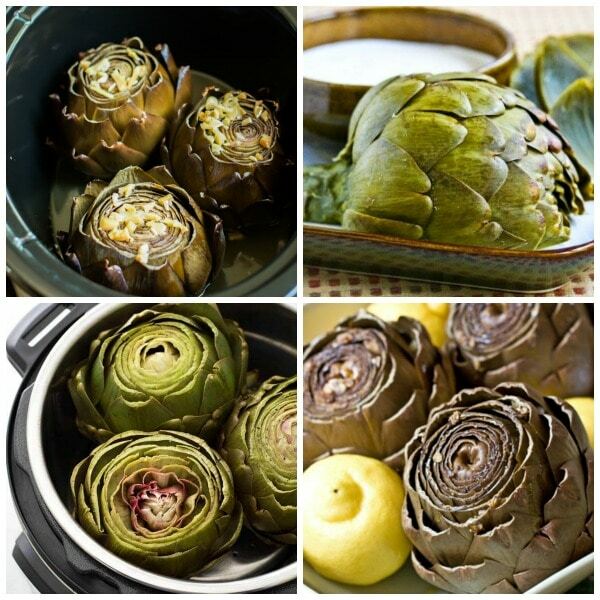 And Slow Cooker Garlic Lemon Butter Artichokes sound wonderful at The Magical Slow Cooker! 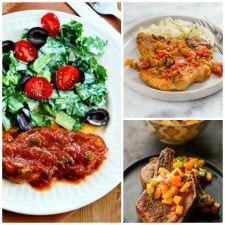 Use the Index Page for Vegetables to see all the slow cooker or pressure cooker Vegetable Recipes that have been featured on this site. What a great idea to gather all those recipes! I have a slow cooker but am still a little unsure how to use it! Hopefully this site will help you with that! Yum! I'm trying this ASAP. So glad to know I can cook artichokes this way! Cara, so glad you like it! I will have to try this!! Cooking artichokes has always been a little challenge for me.